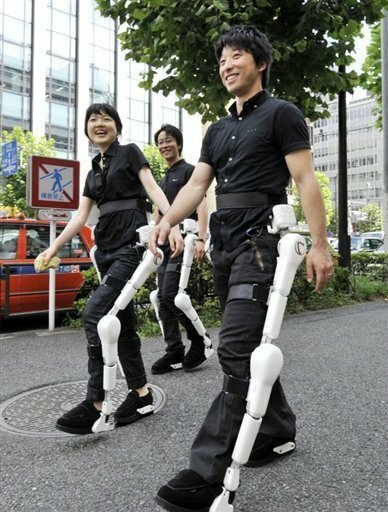 Japan's robotics venture Cyberdyne employee wearing the robot-suit "HAL" (Hybrid Assistive Limb) walk on a street in Tokyo. The three Japanese cyborg look-alikes turned heads on busy Tokyo streets and subway trains Monday as they made their way to a robotics conference on a hot summer's day -- without breaking a sweat. Okay, why is this eye candy Monday? Because tomorrow, Tuesday, October 26 at 7pm, Sharalyn Orbaugh will be giving a free talk as part of Speaking of Dance at SFU Woodward’s, on the topic of “The Rise of Butoh in Post-War Japan”. She is a faculty member at UBC in the departments of Asian Studies and Gender/Women’s Studies, and one of her most recent publications is “Emotional Infectivity: The Japanese Cyborg and the Limits of the Human.” Thus, the Japanese Cyborgs. Why not RSVP to Speaking of Dance on Facebook, or just show up? It’s free and very interesting, especially if you are attending Sankai Juku and would like some context. ~ by DanceHouse on October 25, 2010.